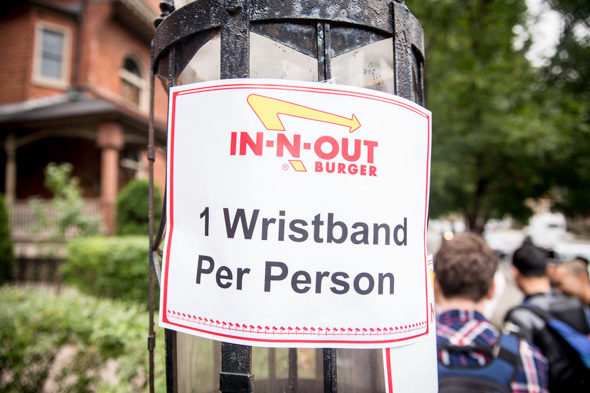 Missed your chance to eat an In-N-Out Burger at their one-day-only Toronto pop-up? If it's any consolation, so did most of the people who showed up at Osteria dei Ganzi on Thursday. 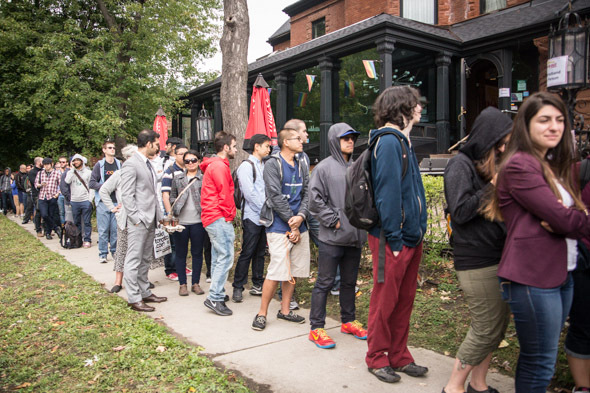 The one-off event quickly whipped up a frenzy online, as Torontonians well-versed in the Cali chain's burgers rejoiced at the prospect of tasting their favourite faraway fast food once again. 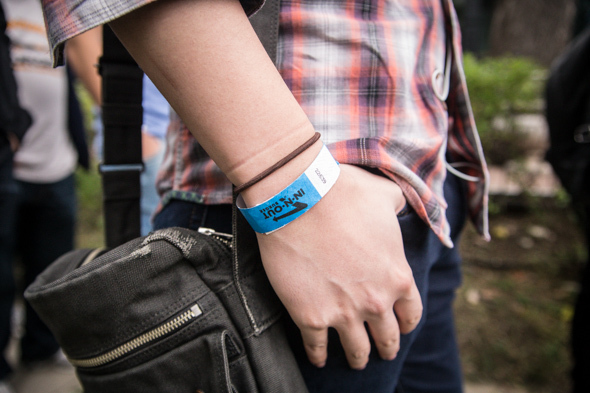 A strict entrance policy was in effect, with security letting diners in a few at a time to come in and collect their burger (no media allowed). An upscale Italian joint like Ganzi may have seemed like an odd choice for fast-food pop-up, but the restaurant's iron gates, brick walls, and low sightlines from the street turned out to be a canny choice - if you wanted to create an impenetrable fortress in which people could eat a hot-ticket meal in peace, this would be the place. Event staff couldn't pin down how many wristbands were handed out or burgers were served that day, but the line of successfully-wristbanded diners wrapped around the front of the restaurant and snaked for a block down Gloucester St. (a few of whom were wearing California-themed T-shirts and In-N-Out merch in honour of the occasion). At the front of the line, I asked a group of folks who'd been waiting since about 9am how many had tried In-N-Out before; most raised their hands. Are the burgers really that good? "It's a cult thing," offered one older gent. It looks like the company aims to keep it that way. Though hopes continually spring eternal for a real, live In-N-Out here in Toronto, it seems that the event is just the latest in a long string of one-off pop-ups, which the company uses to build buzz and awareness around the world - In-N-Out has served burgers in Peru, Ukraine, Spain, Australia, and most recently, Chile. They're also frequent visitors to B.C., where they're known for hosting semi-regular services at an auto show in Langley; over there, event staff tell me, the lines start as early as 5:45am. If you weren't among the lucky few who got to try an "animal-style" burger on Canadian soil, you might be waiting a long, long time before In-N-Out heads back this way again. Otherwise, we hear L.A. is mighty nice this time of year.